On Monday evening I attended the CEW Demo Evening – an opportunity for the members of CEW to try a variety of products by brands that have entered their Beauty Awards. The CEW is Cosmetic Executive Women and is an organisation founded in the USA in 1954 and the UK in 1992 and is a trade organisation for executive women in the cosmetic, fragrance and hairdressing industries. I have been a member for a number of years and it is always a highlight in my work calendar – the opportunity to try new products and meet up with a lot of friends. This year there are 24 categories mixed across mass and prestige and I thought it was a good opportunity to step out of my usual comfort zone and post about things that I have discovered through the event that maybe wouldn’t have come to my attention otherwise. First up is Aveda – a brand close to my heart as it was my first job in the industry a long time ago. No really. I mean a long time ago. They say you never forget your first love and this is certainly true for me. I still love the ethos and products from Aveda – they were ahead of their time when I worked for them and that hasn’t changed today. Aveda’s Control Force Firm Hold Hair Spray is an entry this year and so far I have to say I am very impressed. I have long hair that is coloured within an inch of its life and is that marvellous (sigh) mixture of being fairly fine, but with a lot of it to contend with. Which basically means I am frizz city. If you are aware of Worzel Gummidge, picture him and you have idea of how my hair behaves when left to its own devices. It also means I know a thing or two about hair spray. Those of you that know me in ‘real life’ will know of my partiality to a nice bun. Oh how I do like to rock a bun. And now you know why. Control Force has so far worked when my hair is blow-dryed or tied back and wet or dry. 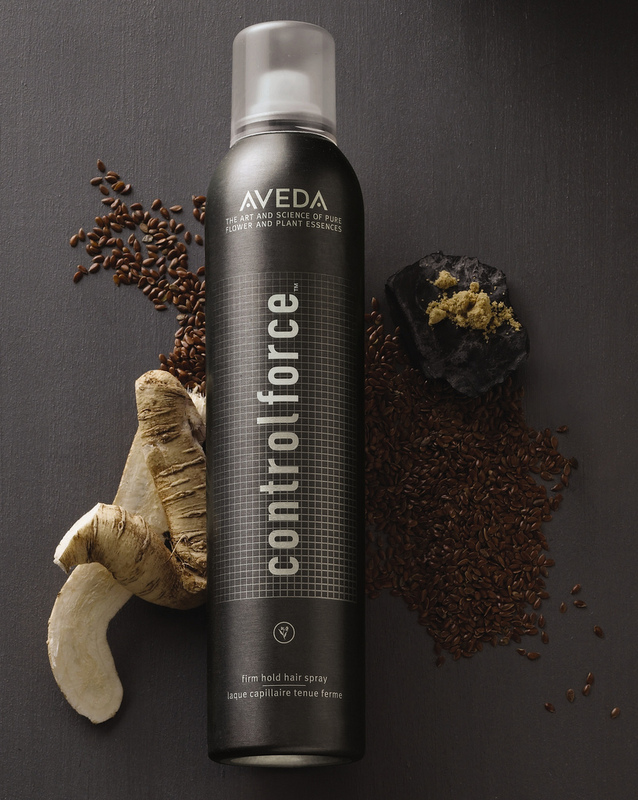 Although it is the firmest hold that Aveda make, the hair is still pliable and it brushes out like a dream. Most importantly for my hair, it has a 24 humidity defence which in my case means it keeps my frizz under control. It also smells divine. I sense that this has replaced Firmata – which was the strongest hair spray Aveda made ‘back in the day’ – this is far superior. Being Aveda it has the added bonus of having a net zero climate impact, which basically means that Aveda offset the carbon emissions associated with the manufacture, transportation and use of every Aveda aerosol sold globally – no mean feat. It is made from a recyclable aluminium container and the essential oils it contains are sourced sustainably and can be traced from field to bottle. If you haven’t tried Aveda but have always been tempted – this is a great place to start – they also have the best selection of travel sizes available in the industry so if you want to try before you commit there’s no excuse! Control Force Firm Hold Hair Spray is £17.50 for 300ml.